For A Bird's Eye View Of The Canyon! Do you want to visit the Grand Canyon Skywalk? The Grand Canyon is a favorite scenic wonder for tourists from all over the world. There are three areas you can visit to see the Canyon. The South Rim is the most developed area and where most of the tourists have traditionally gone. The South Rim is open all year, though some facilities may be closed in winter. The North Rim is your second choice. It has fewer visitors and is closed to visitors in the winter. The Grand Canyon Skywalk is located at the third point of access to the canyon... Grand Canyon West. This is quite far from the other entrances. The land here belongs to the Hualapai Nation Indian Tribe. Years ago when we first saw pictures of the proposed bridge on the internet, we thought it was a hoax, but it is real. It has been built, and it is operating.... and it is hugely popular. It's suspended about 4,000 feet (1,220 meters) above the Colorado River. You will have to plan for this because it is so far from the South Rim. It's about 250 miles (400 km) by road from the South Rim Visitors Center. That's about a 5 hour drive. It's actually outside of the National Park. Too far away for a quick day trip there. Grand Canyon West and the Skywalk are actually closer to Las Vegas than to the South Rim. It's only 120 (190 km) miles from Las Vegas. 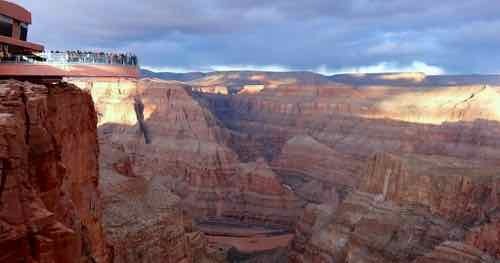 You can get day tours to the Grand Canyon Skywalk from a number of tour operators out of Las Vegas. It takes about 2 1/2 hours to drive there from Las Vegas. If you plan to drive yourself, check on current road conditions. In the first several years, the last 18 miles (29 km) to the Skywalk were on unpaved and bumpy road. This has been under development, so it may get easier to drive there. You might be able to make it in a small car, but it is pretty rough. If you are renting a car, we wouldn't advise taking that sedan on this road until it is developed. It is not suitable for Recreational Vehicles (RVs) either. If you are driving a small car or an RV, there is a "Park and Ride" shuttle service available at the Welcome Center. There is about a $10 fee for this shuttle. 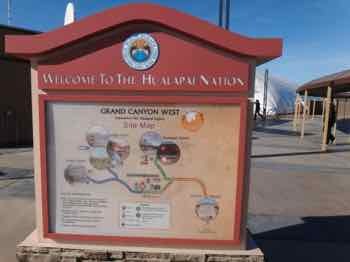 To experience the Skywalk, you must purchase a visitation permit and a package of activities from the Hualapai. The Skywalk fee is in addition to one of the packages, so the minimum cost to visit is about $70. They only allow 120 people on the Skywalk at any one time. Access is first come, first served unless you have a reservation. You will be provided with shoe covers which keep your shoes from scratching the glass... and also help keep you from slipping. One thing you should know besides the high price of the tours is that no personal cameras are supposed to be allowed on the bridge... in case you drop your camera and damage the glass. Womens purses are also checked into lockers. 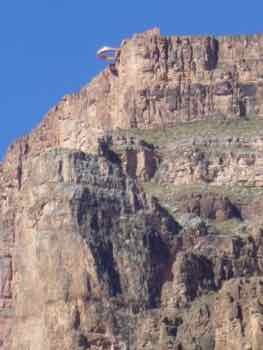 So if you want to walk OVER the Grand Canyon... visit the Grand Canyon Skywalk. Just know what to expect and be prepared.